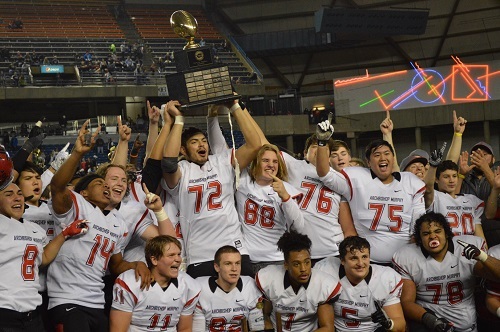 In a year that saw just nine games played for arguably Washington’s best high school football program, the Archbishop Murphy Wildcats put the stamp on the season in cruising to a 56-14 win in the state finals over the Liberty (Issaquah) Patriots. 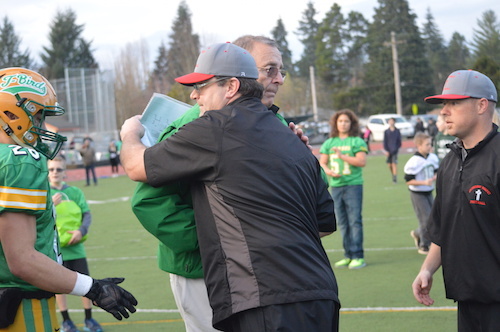 The story from Archbishop Murphy’s program this year came in the way of forfeits. Five of their 14 total games were decided without either team stepping on the field, with four consecutive forfeit wins in late August and early September. They went game-less for over a month because their opposition refused to play in fear of injury and demolition. But this didn’t slow the Wildcats down. During the regular season, Archbishop Murphy gave up a total of 6 points. The Patriots put up an astounding 14 in the final. Kudos to Liberty for never giving up for the full 48 minutes, but this game was over after the first quarter. Quarterback Connor Johnson threw three touchdowns in the first half, and Collin Montez ran for another two, putting the halftime score at 35-7. Connor Johnson would throw for two more touchdowns early in the third, pushing the total to 49-7 heading into the fourth quarter. For Liberty, an undefeated season ended against a team that five teams refused to play. 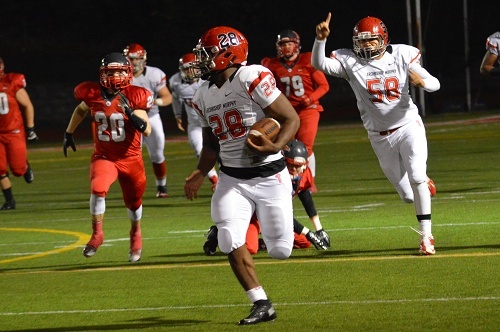 For Archbishop Murphy, the season ended similarly to the way it started, with a blowout win. Congratulations to both teams, and especially to the Wildcats for capturing their first state title in the 2A classification. Archbishop Murphy 56, Liberty (Issaquah) 14. Connor Johnson – 5 passing touchdowns. 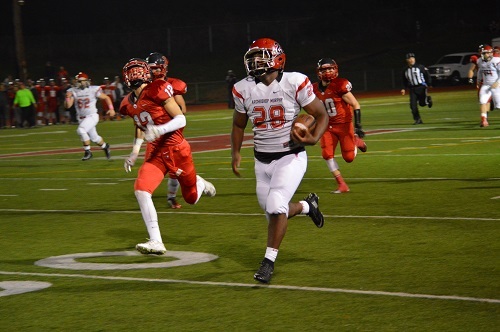 The juggernaut of 2A this season Archbishop Murphy traveled south to take on Sid Otton and Tumwater for a state semi berth and a chance to avenge last year’s finish when the Wildcats were eliminated by this same Tumwater team. Archbishop jumped out to a quick double digit lead as Ryan Henderson buried a 39 yard field goal on the opening drive. Later in the quarter Collin Montez scored the first of many Wildcat touchdowns, this time from one yard out. The Tbirds gathered their composure and established a run game with Noah Andrews and Jakob Holbrook to set up a circus catch in the endzone by Andrew May. Tumwater then tied the game when Nathan Seaman buried a field goal. As the half was winding down, the Tbirds had a chance to take the lead, but the Cats defense held firm and gave their offense a chance to take a lead to the locker room. Anfernee Gurley hauled in a late touchdown grab before the second quarter elapsed and the scoreboard read 17-10 in favor of ATM with one half to go. Tumwater’s defense emerged from the locker room with renewed energy and were able to force two early turnovers. However, these opportunities did not result in any points. The turning point occurred when Collin Montez picked off a pass deep in his team’s territory and ran the ball back 96 yards for the score. Emmanuel Osuoha joined the party with a few late touchdowns to add to the Wildcats lead. Abraham Lucas played a crucial role in the second half shutout of the Tumwater attack. With the win, Archbishop continues their run of dominance and places themselves one step closer to a state title. For Tumwater, their season ends, but more importantly, Sid Otton closes out his legendary coaching career. The emotions on the field after the game covered the gamut and reminded us why we love high school football. Archbishop Murphy 48, Tumwater 10. Archbishop Murphy kicked of the 3rd annual Memorial Classic in dominant fashion as a 52 point outburst in the first half allowed the Wildcats to cruise to victory over their Metro League counterpart. Desi Carey opened the scoring with a 32 yard TD grab early which opened the floodgates. Collin Montez followed that up with a interception for touchdown and a 19 yard rumble to the endzone. The rout continued when Kyler Gordon matched Montez with touchdowns on defense and offense. The game was one sided from the start and Murphy opens their season with a combined margin of victory of 132-0 after their win last week against Issaquah. Bishop Blanchet will look to start anew in 2016 after advancing to the state semifinals a year ago. Meanwhile, Murphy has emerged early as a frontrunner to be not only one of the best teams in 2A, but in the entire state of Washington. Archbishop Murphy 59, Bishop Blanchet 0. 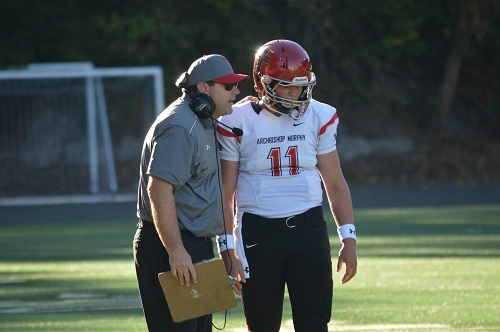 Listen to Steve Willits’ team preview of the Archbishop Murphy Wildcats by clicking on play button below. 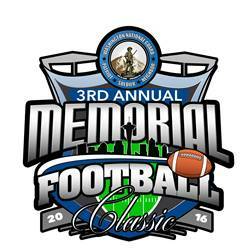 The Third Annual Memorial Football Classic is a special two-day event to celebrate Seattle high school athletes, to raise money for all Seattle public high school athletics, and to build support for the Metro League. Media day for the Memorial Classic was held at Ballard High School Tuesday afternoon to meet coaches and players from the participating schools for a Q&A session. Also, speakers at the event included Seattle City Council President Bruce Harrell (Garfield & University of Washington alum), former Seattle Seahawks Paul Johns & Edwin Bailey, and Seattle Public Schools Director of Athletics Eric McCurdy. Additionally, founder of the event Joey Thomas (Garfield head coach, Kennedy Catholic alum, NFL veteran) has selected Monte Kohler for the “Icon Award” from his long and distinguished coaching career at O’Dea and “Legends of the Game Award” to Terry Metcalf (Franklin alum, NFL veteran) for his outstanding coaching tenure locally. The Tacoma Dome has become a second home for Sid Otton and his T-Birds football team which he sends to deep playoff runs virtually every year. Archbishop Murphy is no stranger to late November football either as the Wildcats were the 2A runner-up in 2010 and 2011. With both teams boasting 12-0 records, who would win the penultimate game of the season? A defensive struggle summarized the first frame as both teams failed to put any points on the board. Archbishop Murphy struck first when Bailey Singh-Ha hauled in a 32 yard pass from Connor Johnson. Exactly three minutes later, Wildcat tailback Anfernee Gurley notched a rushing touchdown. Tumwater’s Noah Andrews made his first big play of the game by taking the ball 43 yards to the house to cut down the lead. AMHS went into halftime feeling good due to Connor Johnson’s quarterback sneak for touchdown at the second quarter buzzer. The Thunderbirds put the clamps on defense down in the second half by preventing the Wildcats from adding to their point total. But they had work to do. Cade Otton answered the call on a 21 yard touchdown early in the third. The game really began to hit the skids at this point as both teams refused to pull away. In the final minutes, Tumwater was down by four. It was gut-check time; touchdown or bust. After a THS timeout, Spencer Dowers executed the play discussed in the huddle perfectly; a quick toss to reliable Andrews who shed a few tackles and dove for the corner pylon. Touchdown! An elated Tumwater sideline breathed a big sigh of relief when the scoreboard read triple zeros after Aiden Slater brought down AM’s quarterback on the final desperation play. After the game, Coach Otton admitted this was up there with one of the best games he has coached. Noah Andrews said with “three minutes left and we’re down, we’re not really having a lot of hope. It’s just never giving up.” On the winning touchdown, he noticed the defender lost his balance and “I saw him dive at my feet, so I just put my hand down, and dove in.” A play this junior leader will likely not forget anytime soon! There are two leaders in the Cascade League that have emerged from the rest of the pack and week eight would retain one of two blemish-free records between Archbishop Murphy and King’s. The visiting AM Wildcats entered the ballgame with a remarkable 353-19 scoring tally in the first seven games. Jim Shapiro’s home King’s squad opened the season with an impressive victory over perennial 2A contender Lynden and kept winning. It was senior night for King’s at Woolsey Stadium; would the Knights defend their home field against league rival? After receiving the opening kickoff, Wildcat tailback Kerry Jackson rumbled 82 yards to the house and gave AMHS an early lead. This immediate strike gave the visitors an upper hand off the bat and would serve as a catalyst for the remainder of the contest. Midway through the first, the Knight’s defended a fake punt by AM in Wildcat territory. Would the Knight’s make them pay? Nope. Anfernee Gurley intercepted a Knight’s pass thirty seconds later and was rewarded with a 10 yard touchdown pass by Connor Johnson on the first play of the second quarter. King’s put together a scoring drive set up by a Jake Welch pick that allowed Andrew Cline to pound the rock into the endzone and bring the score to 21-7. Archbishop Murphy didn’t blink. Kerry Jackson scored another touchdown minutes later after steamrolling a King’s defender at the goal line. At the half, the visitor led 21-7. The opening drive for King’s in the second half seemed important to set the tone for the remainder of the ball game. Unfortunately, they were unable to move the sticks and were forced to punt immediately. The Wildcats put the game out of reach on the ensuing drive when Jackson completed the hat trick on another touchdown run. The rout was in full effect as Archbishop Murphy recorded 21 more points before the final whistle. With a 49-7 final score, Archbishop Murphy has emerged as the clear favorite in the Cascade League. However, King’s has the ability to steer the ship back in the right direction moving forward. They need to get some key starters healthy and put this fluky loss behind them. 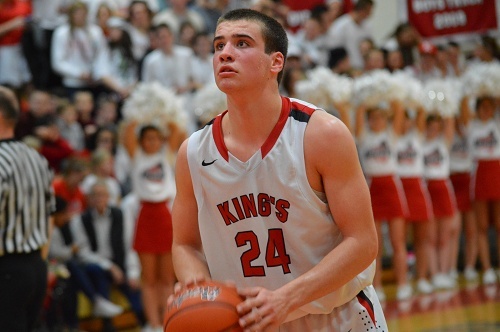 The end of the regular season has arrived and the top dogs of the Cascade League in King’s and Archbishop Murphy would see the rivalry renewed on senior night for the Knights. A packed Mike Martin gymnasium was excited to see undefeated King’s take on second place Archbishop Murphy who was hungry to avenge a 65-40 loss earlier in the season. Would Rick Skeen and Co. finish conference play blemish-free or would the Wildcats play spoiler in the league finale? Archbishop took a quick 7-0 lead to start the contest which got the home team off balance. Coach Skeen switched up his normal starting lineup for senior night and it appeared the chemistry early on was affected. The Knights proceeded to roll out a 14-2 run and capture a lead by the end of the first frame. Corey Kispert drained one of his four three-pointers en route to a game-high 27 points. The dynamic sophomore would go on to show his all-around versatility as a top player in the state. The Wildcats responded in the second quarter by increasing the intensity on both ends of the floor. D’Andre Bryant knocked down some tough shots and the Cats rebounded well as a team. At halftime, the home squad led by a single point at 28-27. With anticipation for an exciting second half, the seesaw ride continued for the majority of the third quarter. Points were at a premium and with a chance to take control of the contest, King’s stood up. Their length advantage paid dividends as tenacious defenders like Noah Bundrant forced turnovers that led to buckets at the other end. Kispert scored nine in the frame including a pair of triples which proved to be daggers. AMHS could not climb back the double digit lead built in the fourth quarter despite efforts by Abraham Lucas and Anfernee Gurley. 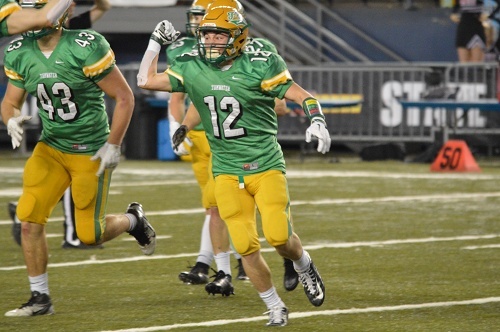 The Knights finish Cascade play undefeated and poised to make a run at the 1A state title.